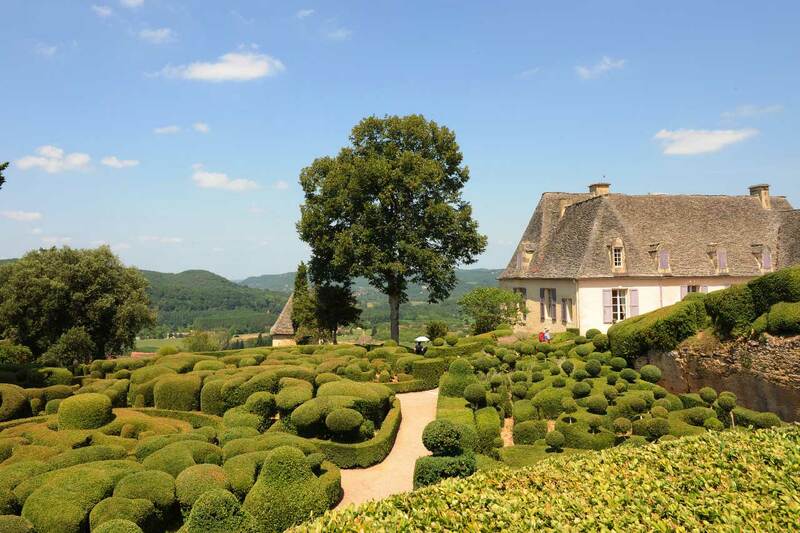 There are so many ways to be amazed in Périgord; it is a province set with so many natural and architectural marvels, and sometimes we can contemplate them both. Travel through time in the Valley of Vezère (a site classified Patrimoine de l’Humanité by UNESCO) from prehistory to history. We can discover 1500 castles; many have gardens, but the ones presented are exceptional. 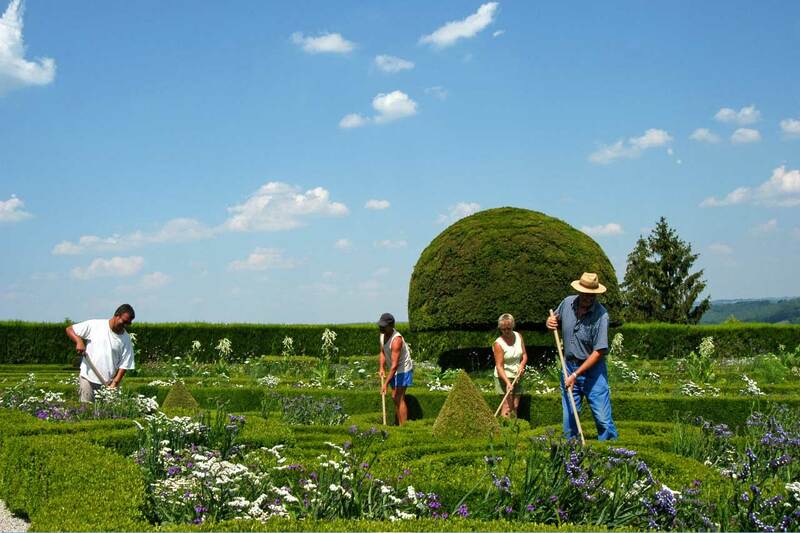 Their maintenance costs a fortune; the Eyrignac gardens and the Marqueyssac hanging gardens are classified among the most beautiful in France. 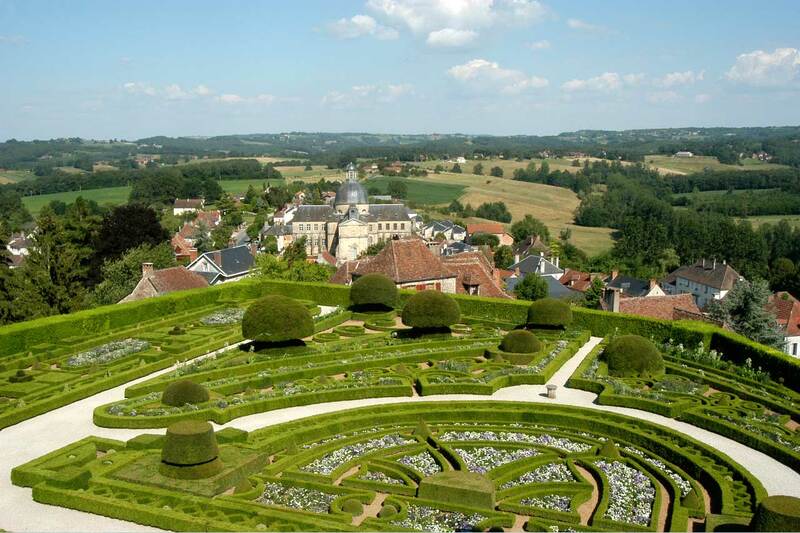 Traditionally, Jardin à la Française are comprised only of green sculpted vegetation; the flowers below at Hautefort are a modern evolution (blasphemy for the purists). The Eyrignac Manor House gardens were designed in the 18th century by the Marquis de Calprenede. 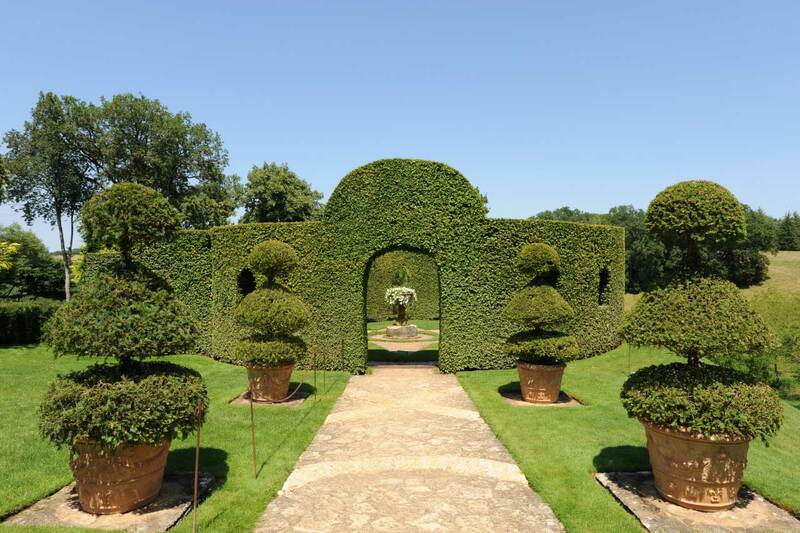 Here is found topiary art at its best; the experience for every visitor is marvelous – what a joy to see the apple trees of a true Garden of Eden! It was very moving to see one of the gardeners cutting bushes with scissors. The image was symbolic to me; such vast labors to attempt perfection, as in life. 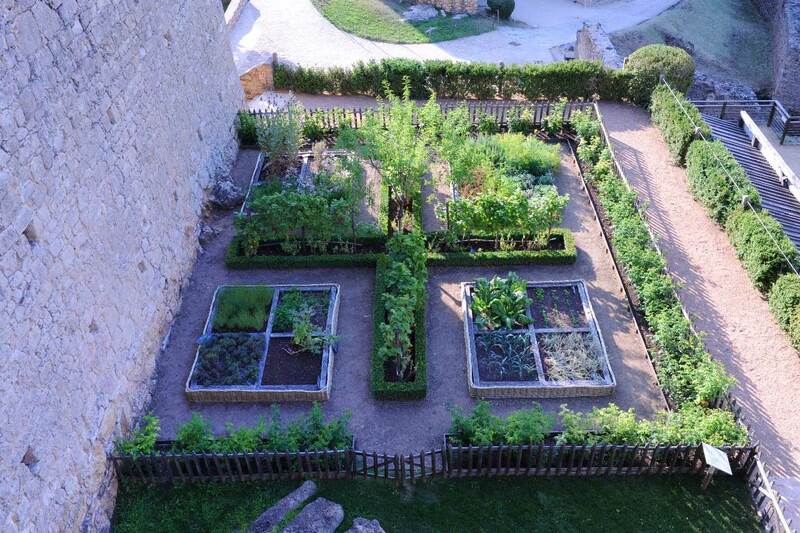 Castelnaud’s garden, dating from the middle ages, is designed in the shape of a cross like a monastery garden. It is protected by a fence lined by roses, the aromatic plants at upper left, the utilitarian ones upper right; vegetables, lower right, and medicinal herbs lower left; in the center there is an almond tree and vines. 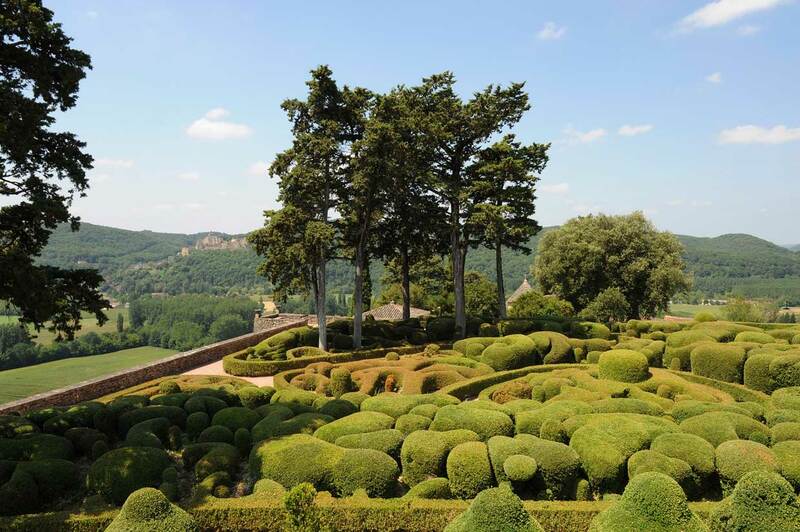 The Jardin de Marqueyssac is 22 hectares big, with 150,000 boxes… What a belvedere in the valley of Dordogne!!! The castle in the distant hills on the left is Castelnaud. 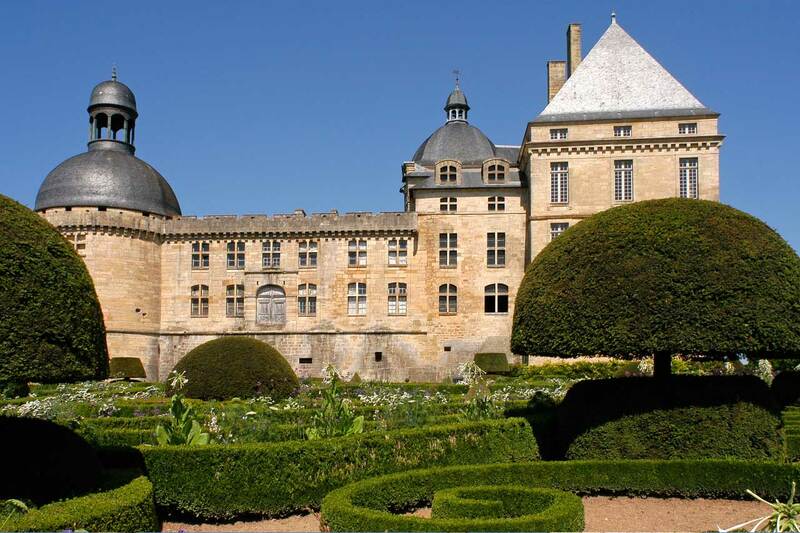 With panoramic views of the Dordogne, the little marvel of Marqueyssac was built just before the revolution. 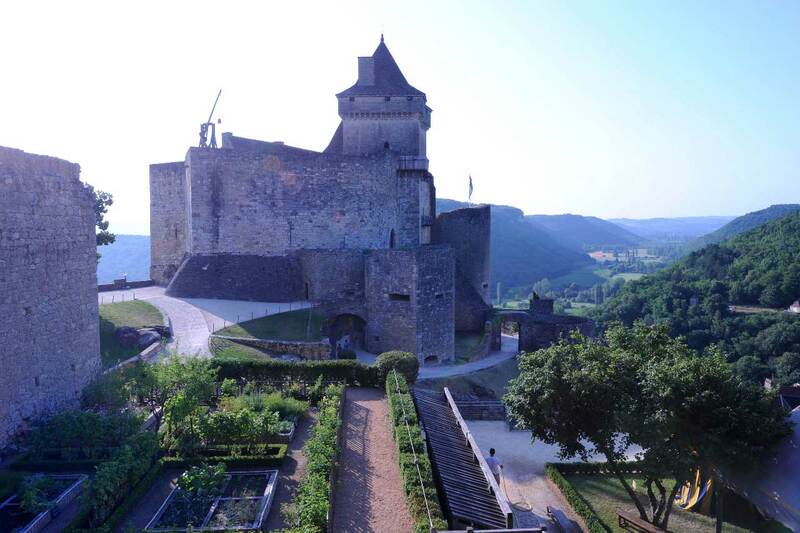 The castle roof was made with lauzes (traditional stones cut for roofs ) and weighs nearly 500 tonnes.